Vídeo da reunião do MGJUG sobre JBoss Rules. Ministrada no dia 08/03/2007 pelo Breno Barros. 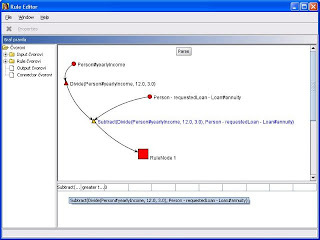 The JBoss Rules community eco-system continues to grow with a new project over at sourceforge, MSM-Combis Rule Editor - http://sourceforge.net/projects/droolsruleedit/. I've downloaded and had a play with the editor and found it very novel, it's a very different approach that I hadn't seen before for graphically authoring rules; it uses inputs and outputs to represent the parts of the rules. 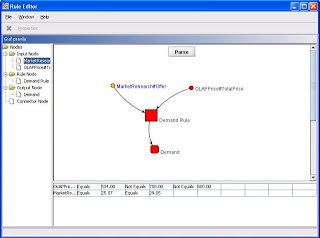 The system also allows you to specify your own models and provides data testing scenarios. They have plans to introduce other areas of AI like fuzzy logic and beyesian logic.